One of the biggest -- and largely unheralded -- signs of Michigan’s economic recovery is the state’s impressive jump in exports. 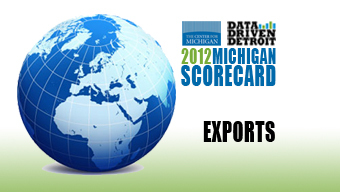 The 2012 Michigan Scorecard ranked exporting as “good,” up from “average” in 2010. But the state’s performance in selling Michigan-made goods around the world has improved even more since the 2012 Scorecard data was compiled. Michigan exports of goods last year totaled $50.8 billion, a 55 percent increase since 2009, when the future of the state’s auto industry was in doubt. State exports grew from $32.7 billion in 2009 to $44.8 billion in 2011, years measured in the 2012 Scorecard. Michigan was the seventh-largest exporting state in 2010, but slipped to eighth last year. Louisiana jumped to seventh place as oil exports recovered from the 2010 BP Deepwater Horizon oil spill in the Gulf of Mexico. The majority of Michigan’s exports last year were cars, trucks and motor vehicle parts. But experts say the Great Recession forced many smaller companies to look for new global markets. A total of 11,210 Michigan companies -- 10,169 of them small businesses -- were engaged in exporting in 2009, the latest available data from the U.S. Commerce Department. “Companies realized in the downturn that they don’t have much choice anymore but to export,” said Patrick McRae, director of international programs at the Prima Civitas Foundation in Lansing. Exporting supported 6.2 percent of all Michigan jobs in 2009 and 26.9 percent of all manufacturing jobs in the state, according to the latest Commerce Department figures. Michigan’s agricultural exports grew from $1.18 billion in 2006 to $1.75 billion in 2010, a 48 percent increase, according to the latest data from the U.S. Department of Agriculture. Michigan is the nation’s 25th largest agricultural exporter. Demand for Michigan soybeans and other commodities is likely to grow as the economies of China and other developing countries expand. McRae, a former U.S. and Foreign Commercial Service officer, said Michigan is benefiting from a renewed focus by the Michigan Economic Development Corp. on helping smaller companies export. “The MEDC completely rebuilt its export promotion department,” he said. “They’re providing assistance in conjunction with the U.S. Export Assistance Centers” in Detroit, Grand Rapids, Pontiac and Ypsilanti. But more awareness of those services is needed by small businesses that want to start exporting, according to a recent Michigan State University survey of 66 companies in several economically distressed, Northern Michigan communities. The survey found that 73 percent of those companies were unaware of federal agencies providing free and low-cost exporting services. “If companies knew about these resources and used them, it would make a big difference,” said J.D. Snyder, a researcher in MSU’s Center for Community and Economic Development. The survey also found that 90 percent of those companies want to export more of their goods and services. MSU created the International Business Center in its Broad Graduate School of Management in 2010 to help Michigan businesses get started in exporting. It has provided assistance to about 50 companies. Rick Haglund has had a distinguished career covering Michigan business, economics and government at newspapers throughout the state. Most recently, at Booth Newspapers he wrote a statewide business column and was one of only three such columnists in Michigan. He also covered the auto industry and Michigan’s economy extensively.